"There was something about the Megadeth tour. We were touring amphitheatres in Rome, playing to sixteen thousand people, and going round in a Transit van, sleeping on top of the equipment. It was four blokes against the world; it was amazing." 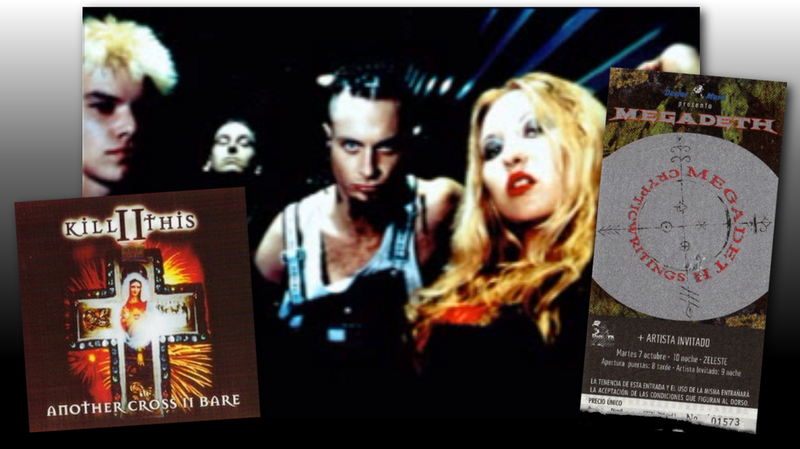 Industrial metallers Kill II This were linchpins of the mid-1990s’ British scene. 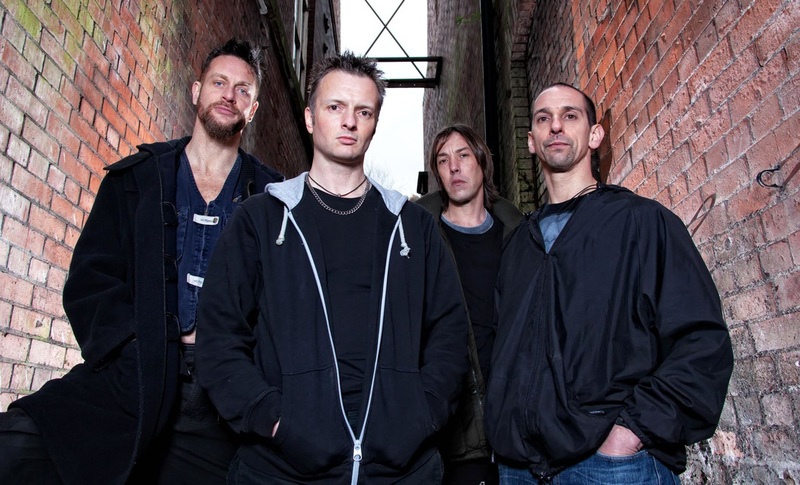 Hard working, they played countless support slots and released four albums between 1996 and 2003, before calling it a day. Now back in their (almost) original guise along with new singer Simon Gordon, the four-piece are ready to take on the machine once more. 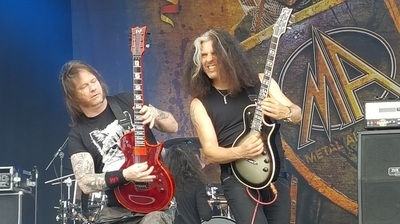 We caught up with the band – Simon, guitarist Mark Mynett, bassist Pete Stone and drummer Jeff Singer following their crushing set at Bloodstock Festival, to chat about their history and plans for the future. Discovering the soundtrack to murder: Eamon O’Neill. Hi guys, how are you all today? JS: Top of the world! MM: Absolutely fantastic. [Introduces gentleman who gate crashes the interview] This is Ross who did our front of house sound, and made us feel rather good! Is that the secret to a great show - a great sound man? MM: Yeah, it is, it is. SG: Always! You do not want to fall out with the sound man! Kill II This have just reformed after a prolonged hiatus, so the big question is; why now? JS: Well, the timing was right, really. We seem to have landed just as there’s a real resurgence of 1990s’ stuff going on. We’ve kind of reformed just before that, so it’s actually good timing for once, for us. Kill II This were like the British Fear Factory back when you originally formed; would that be a fair description? MM: Yeah, I think that’s a fair comparison. JS: Back when we were touring hard, we were one of the first bands using samples, using clicks, and when we were back together rehearsing, we wouldn’t have done it if it didn’t feel relevant, and it does feel relevant; it still feels fresh. The band played on some fantastic bills back in the 1990s. MM: We did, we got very, very lucky. Actually, we just pissed people off by not backing down so they gave us a gig! They were like; “Okay! Can you just stop calling me up, and we’ll give you the support slot?”! ​But that’s what it took to succeed, didn’t it? MM: Absolutely; the squeaking axel gets the grease. We played with the likes of Bruce Dickinson, Skinlab and Entombed. We played with Grim, Megadeth, Machine Head, and Slipknot twice. We played in Scandinavia with Type O Negative. Yeah, we had a good run of it. Kill II This circa 1997. At that time, metal wasn’t doing great business, but Kill II This were fresh and relevant. MM: Yeah, I would say we were; I’d like to think so. JS: Yeah, but prior to that, Peter, Mark and myself specifically, were touring with [former band] China Beach. We were out, we just literally got a van, and out we went – forty German shows. We just did it, because, we always had this ways and means thing; we just; ‘make it happen’. Who did you enjoy touring with most? MM: Machine Head was pretty special. On the last of the tour I got up and played ‘Davidian’ with them, which was one of the best five minutes of my life. JS: I think there was something about the Megadeth tour, when we were touring amphitheatres in Rome, like Palaeur to sixteen thousand people, and eight thousand in Milan. We were going round in a Transit van, sleeping on top of the equipment, and it was four blokes against the world; it was amazing. PS: We didn’t even have a record deal then! JS: When we got that tour, we had the U.K. tour, and on the last night with Megadeth, they said; “we’ve lost the support band for the European leg”, and we said; “we’ll do it”, and we did. As metal fans yourselves, that must have been living the dream for you. MM: We’re very proud of it; it’s what you do, it’s where we’ve come from, and yes we look to the future, but some of the stories and the experiences we have had, together, as a unit, you just couldn’t survive it now. How does it feel to be doing it all again? JS: Simon working with us on the ‘City Of God’ project, we looked at wanting to do this again, and Simon, being friends with the band for over twenty years, he’s just slotted in - he’s the right man for the job. You can be more self-sufficient now, which must be a great thing for you? SG: It’s a whole different ball game, with the whole social media thing. PS: Yeah, it makes you wonder whether you needed a record company before. JS: Also, record sales, we’ve known for years have been on the decline, and bands are touring more. PS: People don’t buy albums anymore; it’s all about releasing a constant stream all the time, and playing the gigs. Live is where you guys thrive though, right? JS: I think so; it’s where we cut our teeth. I wouldn’t like to think about how many gigs we’ve done between us over the years, but the fact is – and Simon as well with what he’s done before too – we are of a generation where we rehearsed religiously twice a week, and gigged, and now It’s more difficult to do that. During my time in Paradise Lost, we never got together much as a band; it was just a ‘rehearse at home gig’. ​Is it strange to be coming back together again? You must have felt like it would never happen again. PS: It feels like that big period of time there we were apart hasn’t happened. Like, Mark actually said the other week, I feel twenty-five again. JS: It’s interesting listening to you talk about the old days; the old venues, the excitement of gigs. Even prior to us being in bands, that excitement of Maiden, the excitement of Priest - Twisted Sister last night; they were brilliant, it was really good, and we come from a generation of exactly that; hard working bands. Kill II This were extremely hard working; you played a lot of those venues. MM: Yeah, we did. It was worth everything, and it was worth every moment of it, because we have some incredible memories. When there’s, god knows how many bands chasing a support slot, and it went to us, yeah, it is something to be proud of. Great memories. I’ve got to ask how it was touring with the famously tetchy Dave Mustaine? JS: They made sure we were taken care of; they made sure we were fed, and had ample sound check time. I remember he came into our dressing room in Germany and said he wanted to talk to us, and we were all sat there just crapping ourselves, but he was really nice. MM: They were amazing – it’s the only tour I’ve ever put weight on! The catering was unbelievable! My favourite memory from the tour was presenting Dave Mustaine – and he had this completely confused look on his face – but, we went into the cloakroom where there were all these hangers and we got ‘hanger 18’ and gave him hanger 18, and he was like; “what the f**k’s this?”! Just this English sense of humour, and then he got it! Back to the present day then, and what’s next for Kill II This; is there a new album on the horizon? PS: We’re working on the new stuff now. We’ve got a couple of tracks ready to go; ‘Sleeper Cell’ and ‘Coma Karma’ are in the final stages of pre-production already. We’re going to get them recorded as quickly as we can, really. I think it’s going to be early autumn, fingers crossed. JS: Then we’ve got a tour the end of October / Early November [see below], and we’re gunning again for the festivals next year again. Finally, is it hard work starting off again? MM: At our age, everything’s hard work; just getting out of the bed in the morning is hard work! PS: We kind of know who we are now, whereas back then we were trying to figure that out. JS: Just going with the flow; we just used to do it. PS: I guess we can be more choosy now, and we can afford to be a bit more choosy. For all the latest on Kill II This visit the bands's official website or find them on Facebook. 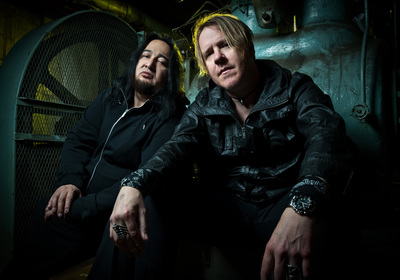 Fear Factory's Dino Talks 'Obsolete' & Being Out Of The Band. 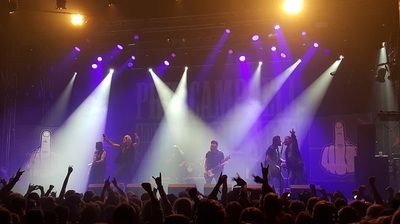 Phil Campbell Joined On Stage By Dee Snider And Pepper Keenan At Bloodstock.